Shortly after the American soldiers disembarked, a group of Spanish and Puerto Rican units began moving from Ponce to Aibonito, marching through the Carretera Central (Central Highway). The caravan was composed of two companies of the Batallón de Cazadores de la Patria (Battalion of the Motherland's Hunters) and some members of the Civil Guard and a Puerto Rican guerilla force. A total of 248 infantry men and 42 members of the cavalry formed the battalions under the command of Lt. Col. Rafael Martínez Illescas, the same person who was in charge of the Ponce garrison. Traveling by foot, the journey would last two days. The group decided to spend one night in Coamo before continuing their march in the morning. Martínez Illescas immediately ordered the construction of several trenches; while building these, the soldiers were ambushed by an anti-Spanish guerilla force, led by Pedro María Descartes, who managed to kill a member of the Civil Guard. 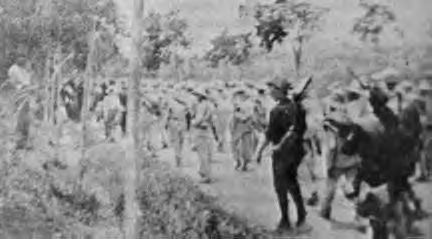 Meanwhile, two battalions of volunteers from Wisconsin and Pennsylvania, led by Generals Oswald H. Ernst and James H. Wilson, settled on opposite sides of the road to Coamo. On August 9, 1898, the Americans began their offensive, opening cannon fire against the city and completing their attack with artillery fire. The Americans intended to encircle and defeat the defenses in the city. A group of soldiers entered the city from the backside, having advanced through a river nearby. The rear assault was reinforced by Wilson's army under General Ernst, attempting to trap the allied soldiers in a crossfire, employing a tactic known as the pincer movement. Martínez Illescas was surprised by the attack and led an improvised attack, but he was killed in the crossfire along with his second-in-command, leaving Captain Hita in charge, who ordered his men to surrender. Half of the allied troops ignored the order, and continued the attack. Hita's men were sent to a prisoner-of-war camp located a Río Descalabrado, while the men who continued to attack retreated to Aibonito when they realized that the Americans were using the pincer movement tactic. Coamo boasts an elegant picturesque downtown plaza area, and is the home of a series of natural hot springs, Los Baños de Coamo, which has attracted visitors to its medicinal waters since even before the Spaniards landed. Indeed, these very springs were once rumored to have been Juan Ponce de León's legendary "fountain of youth", or so the local folklore tells. In the early nineteenth century, a system of pools of varying depths and sizes and temperatures was constructed at the site of these springs to serve as a spa for the colonials. 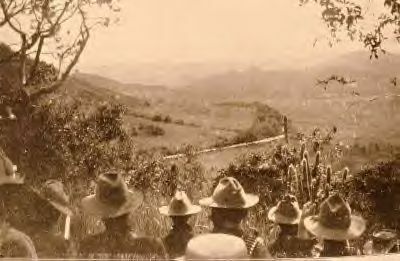 During the North American invasion in the Spanish American War (1898), this site was the scene of one of the decisive battles of that conflict (the Battle of Coamo). The North Americans troops took possession of the island and the spa was subsequently abandoned. Though the site lay in ruins for most of the twentieth century, long neglected, it continued to be a landmark to the Coameños (as the residents of Coamo are called) who would often come to bathe in its healing thermal waters.